Veliko Tarnovo has been often and rightly compared with Rome due to its unique location on three hills – Tsarevets, Trapezitsa and Sveta Gora and crossed by the picturesque Yantra River. The town is situated in Central Northern Bulgaria – 240 km from Sofia, 230 km from Varna, 100 km from Rousse. This strategic location makes it to a meeting point of several important roads. 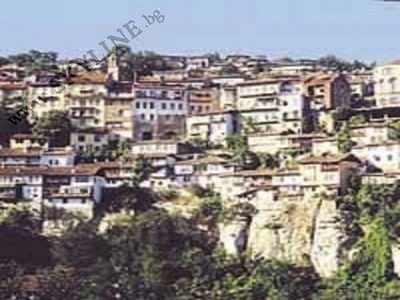 Veliko Tarnovo is the old capital of Bulgaria. From 1185 to 1395 it used to be the political, administrative and cultural centre and the most important fortress in Bulgaria. It was built in 1849 by order of a rich businessman from tarnovo and is one of the architectural masterpieces made by the famous Bulgarian builder from the Revival period Master Kolyo Ficheto. Above the ground floor on the façade has been put a sculpture of a sitting monkey, which gave the house its name. The main fortress of the medieval capital, today an open-air museum where the remains of the medieval palaces and churches are exhibited. Unique audio-video effects complement the perception of the historic atmosphere. Both hills were spiritual centers of the medieval town with lots of churches and monasteries, in which the Medievil Bulgarian culture and arts were preserved and developed. It was built in the 14.century 7 km to the North of Veliko Tarnovo. At the time of the Turkish foreign rule in Bulgaria ( 1395 - 1878 ) the Transfiguration monastery was torched and plundered several times, later completely destroyed. In 1882 it was reconstructed by the genius builder Master Kolyo Ficheto and Zahari Zograf.